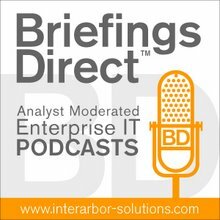 The latest BriefingsDirect podcast discussion delves into proper planning and implementation of data-center virtualization to gain strategic-level advantage in enterprises. Please join me in welcoming our panel: Tom Clement, worldwide portfolio manager in HP Education Services; Bob Meyer, virtualization solutions lead with HP Enterprise Business; Dionne Morgan, worldwide marketing manager at HP Technology Services; Ortega Pittman, worldwide product marketing, HP Enterprise Services, and Ryan Reed, worldwide marketing manager at HP Enterprise Business. The discussion is moderated by BriefingsDirect's Dana Gardner, principal analyst at Interarbor Solutions. Meyer: The downturn has really forced anybody who is on the front to go headlong into virtuali zation. Today, we are technically ahead of where we were a year or two ago with the virtualization experience. Everybody has significant amounts of virtualization in the production environment. They’ve been able to get a handle on what it can do to see what the real results and tangible benefits are. They can see, especially on the capital expenditure side, what it could do for the budgets and what benefits it can deliver. They went from just single percentage points a year and a half ago to 12-15 percent now. Within two years, people are saying it should be about 50 percent. The technology has matured. People have a lot of experience with it. They like what they see in results, and, rather than slow down, it's bringing efficiency to things like the new services model. That's why it's very important for our clients to think about ... how they're going to continue to manage virtualization on an on-going basis, so they keep it under control. Pittman: Many, times small, medium, and large organizations have the virtualization needs, but mi ght not have the skills on hand. The skill demand and the instant ability to get started is something that we take a lot of pride in, and in the global track record of doing that very well is something that HP Enterprise Services can bring from an outsourcing perspective. That's where HP Enterprise Services comes to add value with meeting customers' needs around skills. Clement: Our 30-plus years of experience in providing customer training has shown, time and time again, that technology investments by themselves don’t ensure success. That's really where training comes in. Increasing the technical skills of our customers' people is often one of the most effective ways for them to grow, increase their productivity and boost the success rates of their virtualization initiatives. In fact, an interesting study just last year from IDC found that 60 percent of the factors leading to the general success in the IT function are attributed to the skills of people involved. Our education team can help address both the people and process parts of the equation. Reed: We see a shift in the way that IT organizations have considered what they think would be strategic to their end business function. A lot of that is driven thr ough the analysis that goes into planning for a virtual server environment. Meyer: One thing virtualization does very nicely is blur the connections between the various pieces of infrastructure, and the technology has developed quite a bit to allow that to ebb and flow with the business needs. Pittman: We’d like to work with our customers to understand that it's a starting point to consolidate, but there is a lot more in the broader ecosystem consider, as they think about optimizing their IT environment. Pittman: HP Enterprise Services worked with the Navy/Marine Corps Intranet (NMCI), which is the world’s largest private network, serving and supporting sailors, marines, and civilians in more than 620 locations worldwide. The blog seems to be very much informative and interesting on virtualization techniques. thanks for sharing it here. By the way have you heard about Cloudslam 2009 which is the 1st annual and virtual conference on Cloud Computing. Through the conference I have gathered more information on cloud computing and virtualization.